Hippocampal volumetrics provides valuable information related to the accurate diagnosis of Alzheimer's disease. All of these factors highlight the need for improved diagnosis of memory disorders. Imaging remains an important component of diagnosis for AD but traditionally has been limited to excluding "organic" causes of dementia such as brain tumors and strokes.5 However, newer tools are able to extract additional information from brain MRI scans with quantitative analysis. The main tool being used at UCLA is a program called Neuroreader, an FDA-cleared software program that computes the physical volumes of different brain regions on MRI scans. These volumes can be of entire lobes of the brain, such as the frontal lobes, or of specific structures, such as the hippocampus, known to be abnormal in AD. Neuroreader was validated in the computation of hippocampal volumes6 compared with gold standard expert anatomical tracings. Unlike expert anatomical hippocampal tracings, which can take at least 30 minutes to perform, Neuroreader can compute hippocampal volumes in less than five minutes and multiple structures of the entire brain in less than 10 minutes. This allows for rapid quantitative information clinicians can use in tailoring their diagnostic and therapeutic approaches. One such case involves a 62-year-old man who came to the CHC convinced that he "has Alzheimer's." He had been experiencing progressive memory loss over several years and was worried it had been due to AD. An MRI of the brain showed no visually apparent structural or other abnormalities. Neuroreader analysis did not show atrophy in the hippocampus. This was important because it assured the authors that AD as a cause of his memory loss was very unlikely. In fact, all of the Neuroreader-measured volumes were normal with the exception of one structure. The cerebellum displayed abnormally low volumes compared with a normative database. On observing these volumes, Merrill asked the patient about his alcohol use, and the patient stated that he had consumed one bottle of wine per night for 15 years. This is important information because the cerebellum can shrink specifically as a function of chronic alcohol abuse.11 The patient's cognition improved once his alcohol use was discontinued. In this case, quantitative imaging with Neuoreader was especially helpful in clarifying the etiology of the patient's cognitive decline. Another case demonstrating Neuroreader's utility involves a 51-year-old former high school football player who sustained more than 900 blows to his head over the course of his playing career. One of these blows led to a loss of consciousness of at least 30 seconds. Plagued by subtle but progressive attentional issues that began in his 40s, the patient saw other physicians and was given medications for bipolar disorder and ADHD in an attempt to ameliorate his symptoms. However, these approaches were not fully successful, and the patient continued to experience additional attention problems on neuropsychological testing. Neuroreader analysis of two MRI scans four years apart a showed a progressive gray matter volume loss of 14%, with the majority of these decreases occurring in the brainstem and ventral diencephalon. These findings are important because these regions are also implicated in the pathology of a football-related neurodegenerative disease called chronic traumatic encephalopathy (CTE).12 While we do not have confirmation of CTE in this patient, the convergence of findings raises the possibility of our identification of an MRI signature for the disorder. This is possible due to Neuroreader's ability to measure the volume of nonhippocampal structures such as the brainstem. Another aspect of this case relates to this patient's hippocampal volumes. His first MRI showed a hippocampal volume of 9.02 cc, and his second MRI showed an increase in this volume to 9.49 cc, an increase of 5.2% in four years. The patient underwent MRI scans of the brain at both time points with the exact same scanner specifications, and Neuroreader's variability between scans is less than 0.5%. Therefore, these results are not due to technical error. Additionally, while the patient had attentional problems, he did not exhibit memory loss. This may have been vital in helping him maintain overall neuropsychological function in the face of his other deficits. Another study of 876 participants who engaged in aerobic physical activities showed larger gray matter volumes on quantitative MRI, with strong main effects in the hippocampus.14 Thus, even in this former athlete suffering from brain damage, volumetric MRI with Neuroreader not only identified brain areas that were doing progressively worse over time but also showed areas that were preserved or—in the case of the hippocampus—even improved. These findings, although seen only in one case, raise the possibility of using volumetric imaging not only to hone a differential diagnosis but also to track responses of the brain to different treatment and prevention regimens. There exists a compelling need for additional longitudinal and randomized clinical trials to further develop the value of this approach. However, if such trials are forthcoming, one could envision a future where individuals at high risk for developing Alzheimer's dementia, either through genetics like APOE4 or lifestyle behaviors,15 can be scanned with volumetric MRI and quantified with Neuoreader to identify early atrophy and then track these regions as therapeutic or prevention regimens are advances over time. 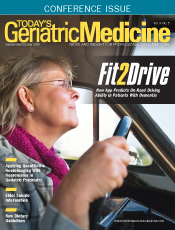 For this to happen, geriatric psychiatrists will need to innovate a multidisciplinary approach for comprehensive care, and radiologists will need to work closely with psychiatrists to hone the imaging of cognitive disorders. UCLA's CHC remains a model of this approach that can be applied throughout the country as the aging population continues to expand. Such an approach is vital, given the recognition that AD can and should be prevented and that lifestyle factor modification is part of this plan.16 It has been estimated that a 10% to 25% reduction in the burden of preventable lifestyle factors, such as physical inactivity, obesity, smoking, hypertension, diabetes mellitus, depression, and low education, can cut the number of Alzheimer's cases by as many as 3 million worldwide.15 Imaging will remain an important component of this strategy in terms of identifying persons at risk or early in the course of cognitive decline and tracking responses to brain rehabilitation programs. One example in which this might display effectiveness is in a randomized clinical trial in which persons assigned to an aerobic exercise regimen experienced a 2% increase in hippocampal volume in one year along with improvement in memory function, compared with a passive stretching group.17 The importance of this study lies in its results and randomized clinical trial design, providing very strong evidence of a causal relationship between a lifestyle behavior—in this case physical activity—and improved brain structure and memory function. Such results were shown with volumetric MRI. Current studies under way are combining physical exercise with dietary improvement and/or cognitive training regimens. Additionally, it is important to note that obtaining a volumetric MRI remains part of the standard of care in working up memory disorders.5 While volumetric MRI is not yet recommended as part of this standard workup, it can easily be applied to preexisting scans to add value in ways similar to the cases described in this article. Ordering a volumetric MRI requires simple but specific instructions, mainly writing in order comments to "obtain a 3D MPRAGE or SPGR." This informs the MRI technologist to acquire a fully volumetric sequence that allows for Neuroreader analysis. However, while the majority of this article has been devoted to AD, it is notable to understand that regionally specific atrophy is a feature of other brain disorders as well. For example, persons with depression experience atrophy of the amygdala, the brain's key emotional structure,24 and this is a brain structure also measured with Neuroreader. Indeed, a recent systematic review showed that the basal ganglia, insula, and temporal cortex show greater atrophy in neurological disorders.25 Conversely, psychiatric diseases are more likely to be related to atrophy in different structures such as the cingulate, medial frontal, superior frontal, and occipital lobes. While simple, this classification scheme can be used to better distinguish neurological and psychiatric diseases using volumetric MRI while identifying possible areas of overlap. As with other questions raised in this article, additional research is needed to identify how best to add value for patients, using these tools, but simple applications such as those described above can presently be applied. Finally, it is important to remember that neuroimaging remains an important tool, but ultimately only a tool. At the core of any successful patient care endeavor is listening to the patient, taking the time and care to understand the clinical issues involved, and, most importantly, treating the patient rather than just a scan or lab value. It is with this mentality that all patient care of this vulnerable population of persons with memory loss disorders will succeed. — Cyrus A. Raji, MD, PhD, is a clinical neuroradiology fellow at the University of California, San Francisco with 10 years of experience in research on neurodegenerative disease. — David A. Merrill, MD, PhD, is an assistant clinical professor of psychiatry at UCLA Health Systems and the founder of the Cognitive Health Clinic. 1. 2016 Alzheimer's disease facts and figures. Alzheimer's Association website. http://www.alz.org/facts/. Accessed July 27, 2016. 2. Happich M, Kirson NY, Desai U, et al. Excess costs associated with possible misdiagnosis of Alzheimer's disease among patients with vascular dementia in a UK CPRD population. J Alzheimers Dis. 2016;53(1):171-183. 3. Barnes DE, Yaffe K, Byers AL, McCormick M, Schaefer C, Whitmer RA. Midlife vs late-life depressive symptoms and risk of dementia: differential effects for Alzheimer disease and vascular dementia. Arch Gen Psychiatry. 2012;69(5):493-498. 4. Shively S, Scher AI, Perl DP, Diaz-Arrastia R. Dementia resulting from traumatic brain injury: what is the pathology? Arch Neurol. 2012;69(10):1245-1251. 5. Knopman DS, DeKosky ST, Cummings JL, et al. Practice parameter: diagnosis of dementia (an evidence-based review). Report of the Quality Standards Subcommittee of the American Academy of Neurology. Neurology. 2001;56(9):1143-1153. 6. Ahdidan J, Raji CA, DeYoe EA,et al. Quantitative neuroimaging software for clinical assessment of hippocampal volumes on MR imaging. J Alzheimers Dis. 2015;49(3):723-732. 7. Raicher I, Takahashi DY, Kanda PAM, Nitrini R, Anghinah R. qEEG spectral peak in Alzheimer's disease: a possible tool for treatment follow-up. Dementia & Neuropsychologia. 2008;2(1):9-12. 8. Cecchi M, Moore DK, Sadowsky CH, et al. A clinical trial to validate event-related potential markers of Alzheimer's disease in outpatient settings. Alzheimers Dement (Amst). 2015;1(4):387-394. 9. Laasko MP, Lehtovirta M, Partanen K, Riekkinen PJ, Soininen H. Hippocampus in Alzheimer's disease: a 3-year follow-up MRI study. Biol Psychiatry. 2000;47(6):557-561. 10. Ross DE, Ochs AL, DeSmit ME, Seabaugh JM, Havranek MD; Alzheimer's Disease Neuroimaging Initiative. Man versus machine part 2: comparison of radiologists' interpretations and NeuroQuant measures of brain asymmetry and progressive atrophy in patients with traumatic brain injury. J Neuropsychiatry Clin Neurosci. 2015;27(2):147-152. 11. Oscar-Berman M, Marinkovic K. Alcohol: effects on neurobehavioral functions and the brain. Neuropsychol Rev. 2007;17(3):239-257. 12. Barrio JR, Small GW, Wong KP, et al. In vivo characterization of chronic traumatic encephalopathy using [F-18]FDDNP PET brain imaging. Proc Natl Acad Sci U S A. 2015;112(16):E2039-2047. 13. Raji CA, Erickson KI, Lopez OL, et al. Regular fish consumption and age-related brain gray matter loss. Am J Prev Med. 2014;47(4):444-451. 14. Raji CA, Merrill DA, Eyre H, et al. Longitudinal relationships between caloric expenditure and gray matter in the cardiovascular health study. J Alzheimers Dis. 2016;52(2):719-729. 15. Barnes DE, Yaffe K. The projected effect of risk factor reduction on Alzheimer's disease prevalence. Lancet Neurol. 2011;10(9):819-828. 16. Smith AD, Yaffe K. Dementia (including Alzheimer's disease) can be prevented: statement supported by international experts. J Alzheimers Dis. 2014;38(4):699-703. 17. Erickson KI, Voss MW, Prakash RS, et al. Exercise training increases size of hippocampus and improves memory. Proc Natl Acad Sci U S A. 2011;108(7):3017-3022. 18. Desikan RS, Rafii MS, Brewer JB, Hess CP. An expanded role for neuroimaging in the evaluation of memory impairment. AJNR Am J Neuroradiol. 2013;34(11):2075-2082. 19. Hunter CA, Kirson NY, Desai U, Cummings AK, Faries DE, Birnbaum HG. Medical costs of Alzheimer's disease misdiagnosis among US Medicare beneficiaries. Alzheimers Dement. 2015;11(8): 887-895. 20. Braak H, Braak E. Neuropathological stageing of Alzheimer-related changes. Acta Neuropathol. 1991;82(4):239-259. 21. Dickerson BC, Stoub TR, Shah RC, et al. Alzheimer-signature MRI biomarker predicts AD dementia in cognitively normal adults. Neurology. 2011;76(16):1395-1402. 22. Cotman CW, Engesser-Cesar C. Exercise enhances and protects brain function. Exerc Sport Sci Rev. 2002;30(2):75-79. 23. Cotman CW, Berchtold NC. Exercise: a behavioral intervention to enhance brain health and plasticity. Trends Neurosci. 2002;25(6):295-301. 24. Brendel M, Reinisch V, Kalinowski E, et al. Hypometabolism in brain of cognitively normal patients with depressive symptoms is accompanied by atrophy-related partial volume effects. Curr Alzheimer Res. 2016;13(5):475-486. 25. Crossley NA, Scott J, Ellison-Wright I, Mechelli A. Neuroimaging distinction between neurological and psychiatric disorders. Br J Psychiatry. 2015;207(5):429-434. 26. Sardanelli F, Bashir H, Berzaczy D, et al. The role of imaging specialists as authors of systematic reviews on diagnostic and interventional imaging and its impact on scientific quality: report from the EuroAIM Evidence-based Radiology Working Group. Radiology. 2014;272(2):533-540. 27. Raji CA, Eyre H, Wei SH, et al. Hot topics in research: preventive neuroradiology in brain aging and cognitive decline. AJNR Am J Neuroradiol. 2015;36(10):1803-1809.